NetSuite Destination Component is SSIS Data Flow Component for loading data into NetSuite record. 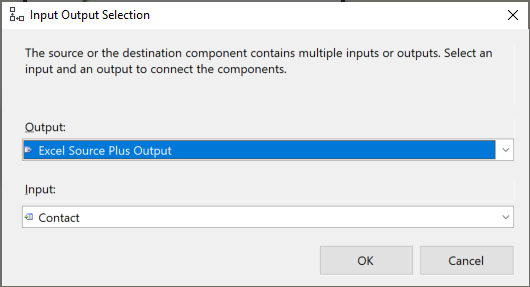 The configuration parameters are provided in the standard data flow destination component dialog. A separate input is setup for the main record and each related composite record. In this section we will show you how to set up a NetSuite Destination component. Configure a source component that will provide the data to be written to NetSuite. In the SSIS Toolbox, locate the NetSuite Destination component and drag it onto the Data Flow canvas. Choose the desired Action (Create, Update, Delete, or Upsert). In this example, we chose the Create action. Choose the Record you will be working with. We will work with the Contact record in this example. 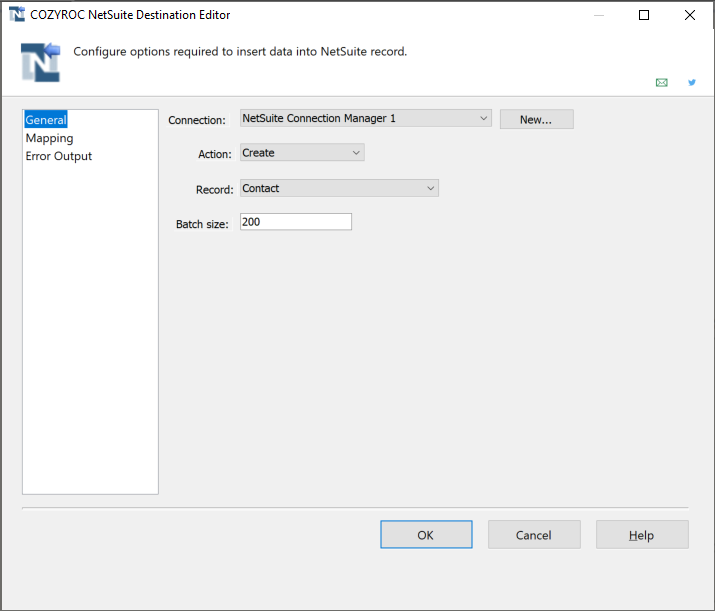 Connect the blue arrow from the source component or the data flow transformation that you want to immediately precede the NetSuite Destination component. An Input Output Selection window will pop up. Under Input, select the specific record you want to direct the output to. In this example, we chose Contact. Click OK to close the Input Output Selection window. Congratulations! You have successfully configured the NetSuite Destination component. Create Create new instance in the destination NetSuite record. Update Update existing instance in the destination NetSuite record. You have to specify internalId for the update to work. Delete Delete existing instance from the destination NetSuite record. Upsert Update and insert record in the destination NetSuite record. You have to specify externalId for action to work. Specify the destination NetSuite record where the data is loaded. Where can I find the documentation for the NetSuite Destination? How to work with composite records handling in a Netsuite destination component. How to find which records contain errors in NetSuite destination component. Fixed: Component failed to set custom fields to NULL (Thank you, Dave). Fixed: Component failed to delete records from custom record type (Thank you, Mark).